Sadly, you can't update the casing to one of your preference. The my201x has the classical form to suggest it should cost more than the £25 they'll charge you for it in the high street. But on the negative side, it won't immediately grab attention - it is a simple light grey and black affair, which may not be everyone's idea of fun, and if you don't like it, you can't customise the appearance with new casings. 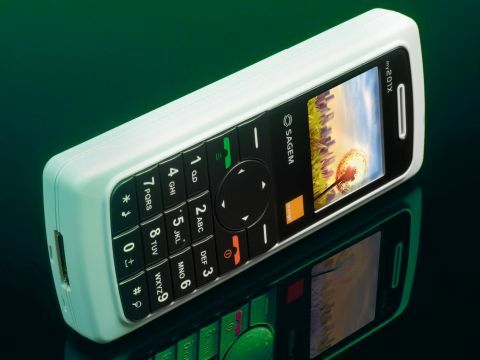 The colour screen is very similar in size and colour specification to that found inside the Alcatel One Touch E256 but it is Sagem that puts the 8000 pixels and 4000 colours to the best use. The menus allow you to customise wallpapers and screensavers with a number of pictures and cute animations, and on-screen icons use the full available palette. However, a great feature of this phone is that you can add other ringtones (and pictures) thanks to the provision of Wap. Sure, that's a standard feature on virtually all phones nowadays, but in the budget basement it's still a bonus. This is old-fashioned Wap, with a dial-up connection and without the benefit of GPRS download speeds. However, it does give you the scope to customise your phone more and also provides useful access to a whole host of different information services. You are limited to one game, and surprisingly this makes little use of the colour screen. Called ArcadeBox, it is a version of the superb Erix game that used to be a firm favourite on Ericsson phones. Other onboard tools include a stopwatch, currency converter, calendar, calculator, and even the option of connecting your handset up to your laptop.